This photo was taken on the day we officially met for the first time. The first time I laid my eyes on you, you were almost four or five months old. You took an immediate liking to me. You made the first move to come make friends with me. You were brave even though you have never seen me before in your young life. 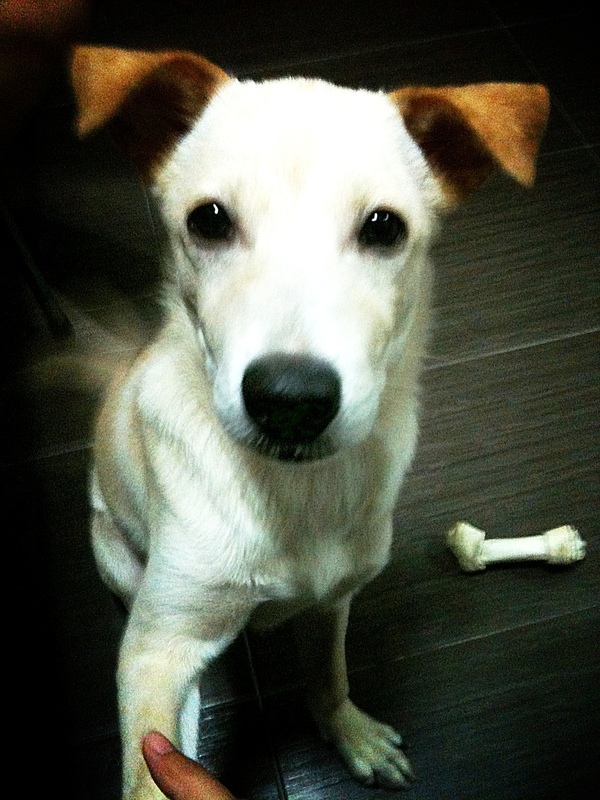 Your tail wagged so enthusiastically whenever I patted your head or kissed your forehead. When I said “hand” to you, you’d immediately lift your paw up and place it gently on my outstretched hand. I kept repeating the command and you willingly entertained me that night. You kept close to me the entire time I was at your place, urging me to play or simply to sit quietly at my side. The truth is I felt like I have known you even before I met you. And maybe somehow, you felt the same way. Yes, I have known you ever since you were born and found on a grass field somewhere in the Western part of the city. Your owner would always update me about you, your quirks, your likes and dislikes and the adorable things you would do on a daily basis. She would send me photos capturing you in the moment. So in a way, I have watched you grown from a tiny, chubby, furry pup to the lean, sleek, large dog you are today. You were less than five days old when your owner and I went to the pet store to buy milk powder and baby bottles for you. We then sat in a cafe near your home and spent the entire evening brainstorming for the right name for you. You were fondly addressed as “Gou Gou” – Mandarin for dog – at home for the time being. It was ok but we thought there could be something more official so we came out with many inspired suggestions but none seemed right. Until I revealed one of my favourite character’s name from Lord of the Rings. He was a good-looking elf who had luscious long blond hair and excellent arrow shooting skills. I still go “woah” when I recall the scene where he nimbly swung up a running horse from its front in the second movie of the trilogy. Yes, Legolas. You were named after someone who made millions of girls and fanboys swoon. When your owner heard the name for the first time, I could see her picturing herself calling you Legolas out loud. She mouthed the name a few times silently and said she liked the sound of it. You should know the other option she had was “Xiao Gou”, Mandarin for small dog. On hindsight, Lego, you were given the perfect name. The one-year-old you today have blond fur and two distinctive brown soft ears. I always tell your owner jokingly that your ears look like those kangaroo skin souvenir key chains. And once a while, you do have strangers coming up to gush over how cute you are. And for a little extra titbit, Lego is also derived from the Danish phrase, leg godt, which means “play well”. And because you were born during the World Cup fever with the eventual champions hailing from Spain and your owner’s favourite tune then was “Alejandro” by Lady Gaga, she decided to include that as your middle name. You were given aristocracy even at a young age. These days, you’re also sporting a collar, which according to your owner and her sister, makes you look “rather man”. Even though I don’t see you as often as I want to, I think about you often enough. I went to the pet store today because I know it’s your birthday. I know I should have gotten you a toy because that is more lasting but I got you some gourmet duck mixed with cod fish and sweet potatoes instead. It does not look pretty even though it sounds fancy but I heard from my co-workers that this is a healthy snack for dogs and I know you haven’t had a chance to taste duck meat yet. Then again, your owner may have been secretly feeding bits of her dinner and you know how she loves eating roast duck. Which was also another reason I wanted you to try duck. Maybe you’d be just like your owner. I don’t know if I will ever see you again, but I will post my simple gift to you before it expires. Your presence has brought so much joy to your family and the amount of love they have shown you always amazes me because everything they do proves that you have unwittingly become the main star in their lives within such a short span of time. You are now truly part of the family. And because I love her, I love you with equal measure and unconditionally as well. I have never cleaned up after a dog my entire life but I willingly do it for you. I have started watching shows on dogs so I could understand (and train) you better. I am conscious about your well-being and I always try to include you in our plans like going for walks or picnics. Whenever you were naughty and made her angry, I’d try to explain your behaviour and defend your innocence because that’s what a good human form does. In return, you have shown me unconditional love, affection and enthusiasm. I miss squashing your tiny face passionately while putting my face really close to your face and rubbing your chest fur. Happy birthday, Lego. You’re the best dog form a human could ever have.